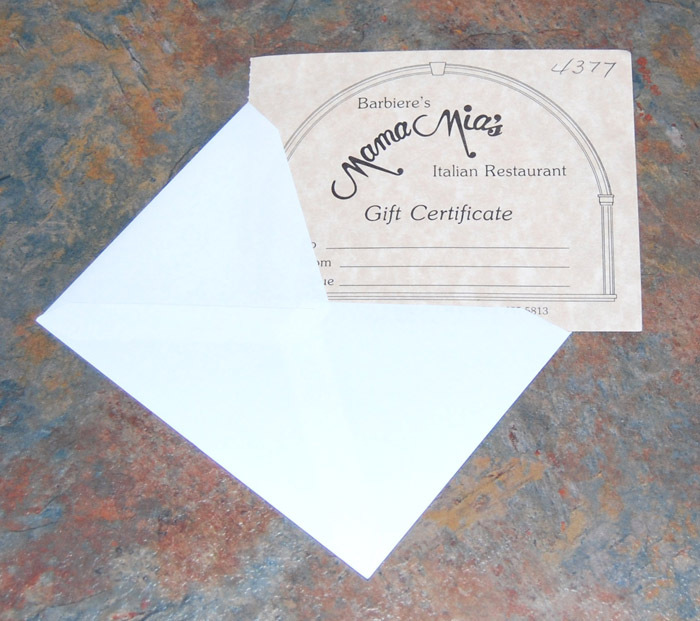 Mama Mia’s gift certificates make a great gift for any occasion, anniversaries – birthdays, holidays, you name it! You can purchase gift certificates in our restaurant 361 days a year (including Christmas Eve until 5:00 PM) or online anytime by ordering below. Mama Mia’s gift certificate are available at any time for any amount by clicking “Buy Now” below. Order yours today! Gift certificate cost includes a gift card and an envelope. You can order online below or anytime by calling us at (906) 485-5813. All online orders will be mailed out to your specified shipping address, if you would like to pick your certificate up at the restaurant either order by phone or just order in the restaurant during our normal operating hours.